Often described as the 'jewel' in the crown of the Suffolk coastline, Southwold is a firm favourite with this particular treasure hunter. And while this coastal treasure trove is hardly 'hidden' (it made Coast Magazine's Top 10 British Coastal Towns this week), in my humble opinion no trip to Suffolk is complete without a trip to Southwold. Apparently, one of Southwold's famous beach huts is for sale in the popular Gun Hill area of the town and it looks like it might fetch £80,000. 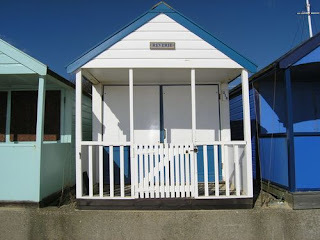 In fact, the local media has gone into a bit of a frenzy about this smart blue and white beach hut named 'Reverie' which appears to be bucking the current sloping trend in property prices. Of course, this seems like an outrageous price to pay for a few square metres of shed on the beach (and remember we're talking British beach - where it rains most of the time). But if I had a spare £80,000 lying around, I'd love to buy a beach hut here. I can't think of anything that evokes childhood holiday nostalgia more. I have a wonderfully flamboyant uncle - chef and housekeeper, flower arranger and party organiser extraordinaire - who used to entertain from his bijou beach hut at Herne Bay in Kent when we were children. My memories are like a scene from Country Living magazine - the only trouble was that the colour co-ordinated plastic buckets and spades which hung on the wall were ornamental. Beach huts were first introduced to British seaside resorts in the Edwardian and post-first world war era, when it finally became acceptable for men and women to 'bathe' in public together. 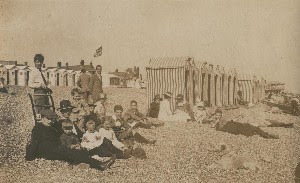 Councils provided beach huts and tents on the beach so that people could change into their swimming costumes out of view. Before this, men and women bathed on separate beaches and changed in bathing 'machines' which were towed to the shoreline in an elaborate attempt to keep everyone's dignity in tact. Oh my, how times have changed! 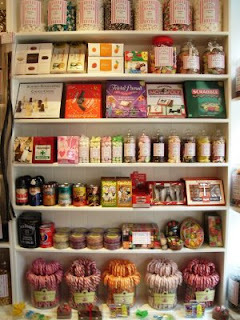 To wrap up the childhood nostalgia theme, there's an old fashioned sweet shop in Southwold - Number One St James' Green - which is chock full of childhood favourites: a mind-boggling array of traditional boiled sweets, handmade fudge and locally sourced lavender honey. So I end the day eating sweets on the beach next to a candy-coloured string of beach huts in the sunshine - can't get much better really. I love Southwold - there's a really nice art gallery on the main street as well.